the History of Branchell ColorFlyte Tableware A brief, marginally accurate, and completely biased view of the background and origin of ColorFlyte Dinnerware grub, anyone? July 1998 The Secretary of State, of the State of Missouri graciously provided some information about the Branchell Company. In doing so, she has set herself apart from the numerous others that have sent form letters explaining that they probably have plenty of information in their files but that they can't justify taking the time to look. The Branchell Company was formed on May 26, 1952, and registered its' address as 1610 Hampton Avenue, Saint Louis. If memory serves, I was a 4-month old embryo at that time. The company was listed as a four-way partnership, with partners Edward Belwich and Ernest Hellmich dividing 65.2% ownership equally between the two of them. The other two partners are listed as Emil Bellmich and Karl Kross. All four owners listed Missouri residences. I have to wonder if Belwich and Hellmich picked Bellmich because they thought it would be cool to have someone with half of each of their names, or perhaps he was some half-human half plastic being, like the Cybermen that liked to pester Dr. Who, but with ColorFlyte-colored parts!! Hell's Bells! I suppose he could be stopped with scouring powder... A special mahalo to Madam Secretary Rebecca McDowell Cook for helping to bring Branchell history to light . 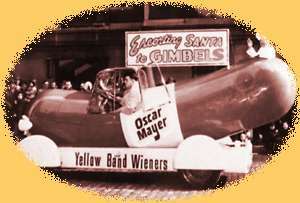 Origins The Branchell company was a division or a subsidiary of Lenox Plastics, with company addresses on Oleatha Avenue in St. Louis, MO and in San Francisco, CA. World War II was over, but in the early 1950's, the American Housewife had declared war on dinnerware that would chip or break, or that couldn't stand up to being washed in the electric, Auto Matic dish-washer. She deserved the best the Atomic Age had to offer, and she got it. . The purpose and philosophy of ColorFlyte Branchell stunned the Modern World with an affordable new line of thermoplastic dinnerware in bold, beautiful colors that were the envy of the Boss' wife, and which could also stand up to Junior's plate-chucking shennanigans. ColorFlyte was designed by Kaye LaMoyne, to be both glamorous and indestructible. It was the one dinnerware that was considered equally well-suited to a hasty luncheon or a hoity-toity holiday dinner. It could be used without a care in the world to serve scraps to some abandoned cat, or to add sparkle to a candlelight dinner at a seven-star hotel. Grease monkeys and Hollywood Stars alike preferred ColorFlyte to breakable "china". At the time, China was full of starving communists with very poor credit ratings and no fins on their cars. With Branchell's new ColorFlyte Melmac, the Jane Jetsons and June Cleavers of Space-Age America could rocket through the day without a care in the world, beginning with a breakfast fit for a king, some liesurely vacuuming and a few soap operas, Tupperized leftovers for lunch for the little baby-boom, and a V-8 trip to the Super Market. As a perfect conclusion to another perfect day, she would have a hytone dinner on the table for the family and company at exactly six o'clock, without missing a single hoofbeat. With power available at the push of a button, everything was a snap. Instant cleanup, secret ingredients, wash-day miracles and penicillin helped make life whiter and brighter. Of course, the table setting for all of these meals could be none other than the versatile and deceptively rugged ColorFlyte by Branchell, which was usually sold on a door-to-door basis and not, as I reported earlier, as open stock at your nearby Sears-Roebuck. ColorFlyte came with a one-year, money-back guarantee against breakage. ColorFlyte - both stunningly gorgeous and virtually impossible to bust into skillions of teensy little pieces. 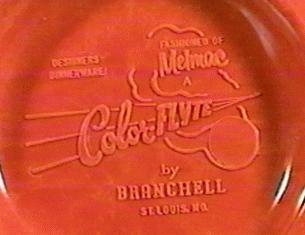 Trademarks Branchell offered two named lines of dinnerware as open stock: ColorFlyte and Royale (the latter sometimes appearing as "ColorFlyte Royale"). I am told that the Royale trademark preceded ColorFlyte. In addition, some print patterns were also available. As far as I can tell, Branchell used the Branchell trademark and the ColorFlyte trademark interchangably or even indiscriminately on the familiar mottled Glow Copper, Mist Grey, Spray Lime, and Glade Green shades of melmac. Those are the colors depicted as backgrounds and elsewhere around this website. The Royale colors, known as Flame Pink,Turquoise Blue, Charcoal Grey, and Gardenia White, are shown in the figure below, taken from original scans of tableware in these colors. the original "Royale" colors It has also been speculated that the ColorFlyte trademark was replaced at some point by the more generic Branchell trademark for business or legal reasons, but I really don't know about this. Incidentally, the original scans of these 4 colors serving as the wallpaper image on these pages are not copyrighted, so please feel free to download them. A small percentage of pieces appearing nearly identical to the orange, light grey, and 2 shades of green ColorFlyte melmac are floating around with no identifying marks whatsoever on them. Most collectors seem to agree that these are worth somewhat less than the logo-labeled pieces. There are at least a couple schools of thought about these, evidently based on guesswork. One is that they are counterfiet, which is something of an amusing concept. It would take an underachiever of a criminal to hustle fake melmac, but stranger things have happened. That would be a little like a counterfieter deciding to try nickels. And the second is that they were made by Branchell without labelling, possibly for contracted production for large institutional orders. The simple elegance of the design, graced with understated accents, have made ColorFlyte a lasting and coveted icon of the 50's. faithfully submitted by Poptard who reminds you to drink, responsibly. And as often as possible, from a Branchell tumbler!! See you in the thrift shops!! return to The ColorFlyte Shrine check out the online ColorFlyte trading post-office return to The Pickled Piper visit Beer-o-rama, my Geocities Home Page Questions, comments, corrections, and contributions are are welcome! For acknowledgments, click here! last updated September, 1998 freebeer@mailexcite.com This page created with Netscape Navigator Gold text, pictures, ideas welcome... Say, pal: this is a grass-roots sort of thing!